This has been a week of organizing and re-organizing, packing and re-packing. And somewhere along the way I managed to do a bit of dyeing. I'm pulling it all together for Vermont Sheep and Wool Festival this weekend. Who can resist Vermont in the fall? This event is held at the Tunbridge Fairgrounds in Tunbridge, Vermont. The Fairgrounds are nestled in the mountains - a very picturesque setting. While I don't expect the colors to be breathtaking after such a dry summer, I'm sure they will still be beautiful. If you're in New England, consider making a road trip. Last year we had an excellent turn out in spite of soggy conditions. I'm looking forward to another fun-filled, fiber weekend. Just in time to hit the road. I made the smallest size, and already I'm plotting my next one only this time larger. The pattern was straight forward and had a nice rhythm. Once I was in the groove this shawlette practically flew off the needles. 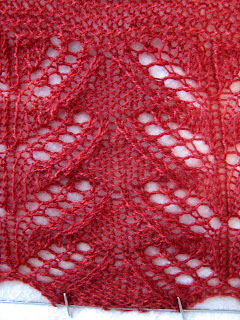 The yarn is Paula from Dirty Water DyeWorks; the colorway is Autumn Red. Paula is 100% Superwash Blue Faced Leicester. The yarn is durable, lustrous and blocks well. If you're in western Massachusetts this Sunday, WEBS is sponsoring Knit and Crochet for the Cure. It sounds like a wonderful way to spend an afternoon and contribute to a worthy cause. 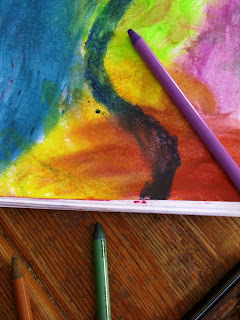 My color inspiration for the week is bright and cheery. 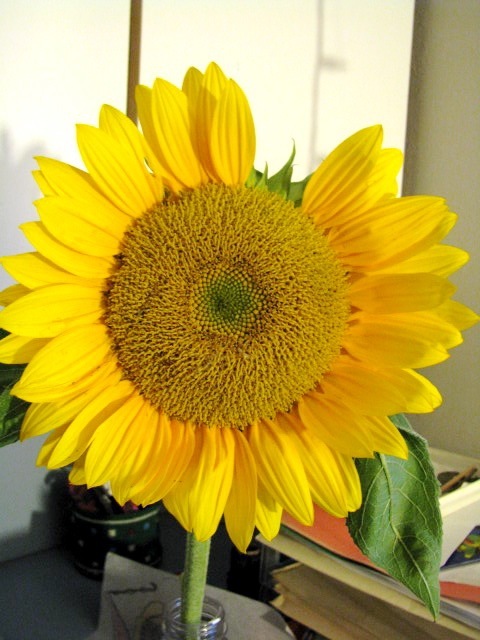 As the daylight gets shorter and shorter every day, it's nice to have an extra burst of sunshine. It was a busy weekend with Dirty Water DyeWorks vending at Fiber Twist, an event that promotes local fiber artists. There was a little bit of everything - needle felting, rug hooking, plant dyed fiber, hand dyed yarn and wool fabric, ready made garments. It was impressive and inspiring. I realized all too late that I didn't take many pictures. I do have this shot of the bag display in the Dirty Water DyeWorks booth. 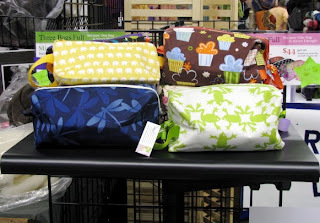 These are project bags from Michele at Three Bags Full. Michele uses fun, colorful fabrics and coordinates them with clever linings. Each bag has a beaded zipper pull. The larger bags come with a small accessory bag. Stop by Michele's Etsy shop to see more. Gail Callahan, aka The Kangaroo Dyer, was there with her beautiful hand dyed yarn and copies of her book, Hand Dyeing Yarn and Fleece. Kristin Nicholas, the goddess of color knitting, had a booth with her books and more. Kristin is now offering patterns available in .pdf format. And she has some adorable sheep postcards. Be sure to check her website. Woollies of Shirkshire Farm was on hand. Sorry, no website. 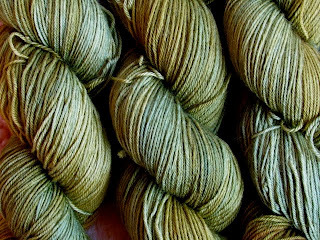 They offer Coopworth wool both natural and plant dyed. If you ever get a chance, be sure to visit their booth. They have some beautiful colors. I fell for the pumpkin - probably because of the season - but could easily have selected any of others. The indigo is still on my mind. On the needles . . . I'm picking up steam with les Abeilles. I'm almost done with the hem and have made enough decreases that the rows seem to be zipping right along. Yes, that's another one of Michele's bags serving as prop. Well, it's Monday and time to get organized. I'm on the road again this coming weekend. Progress on my newest shawlette has been slow. I've moved on to les Abeilles. 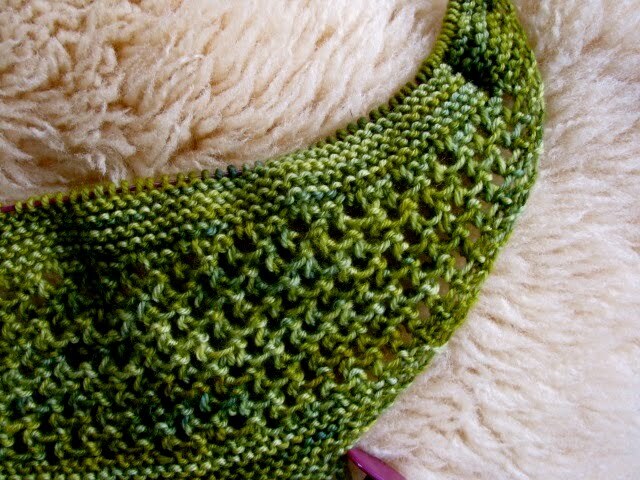 This pattern was recommended to me by more than one person, and I was anxious to get the project underway. I had a couple of false starts. 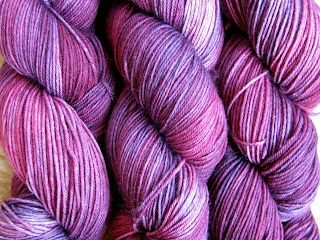 I started with one color that I love dearly but was sidetracked by another equally gorgeous one that I think will look stunning in this pattern. And then there was a slight gauge issue, but I'll spare you the details. So this is my third start with this pattern. My current run of shawlettes all started small and grew bigger. Les Abeilles is the other way around. I'm starting big and going small. I'm sure I'll appreciate that fact at some point, but right now I feel like I'm slogging through mud. Uphill. The 6th annual Fiber Twist is this coming Saturday and is being held in Deerfield, Massachusetts at the Yankee Candle Company flagship store. Dirty Water DyeWorks will be vending at this event, and I'm really looking forward to it. While I worked many events for Dye Dreams, it's liberating and empowering when it's all your own. The vendor line-up for Saturday is diverse and eclectic. I hope I can break away from my booth to see what others are offering. I'll report back next week. 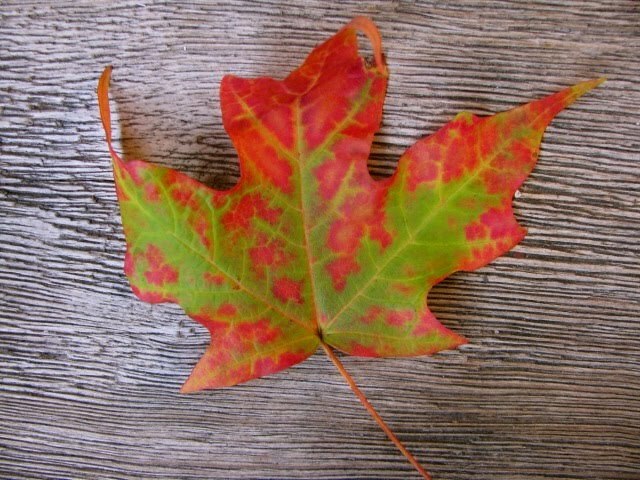 Today marks the first full day of fall. 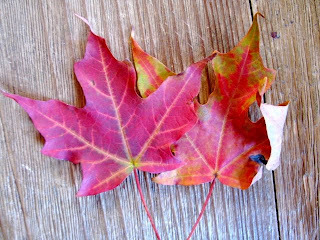 It's no surprise that my color inspiration for the week is all about the season. Green and red, the contrast between summer and fall. Warm reds with depth and intensity. Is that the red les Abeilles yarn I see? 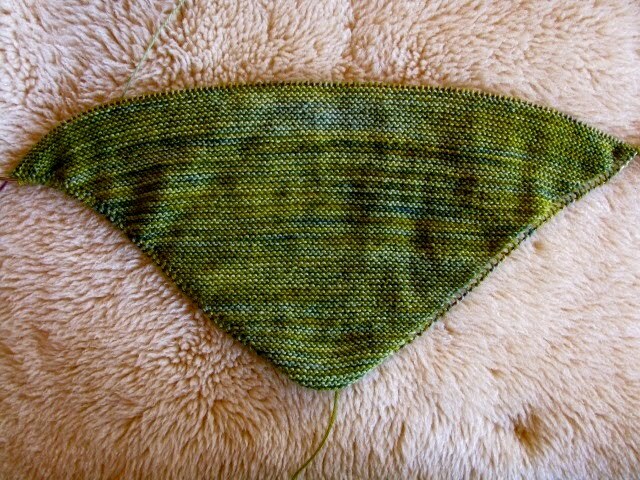 Aestlight (Ravelry link) came off the needles and went right onto the blocking wires. I love this part. This is when the magic begins. 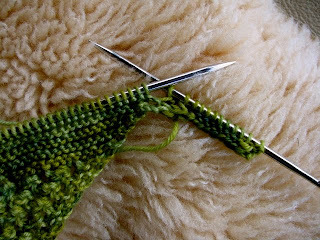 You start with a limp, shapeless piece of knitted fabric that represents hours of work, sometimes mixed with a dose of frustration. You give it a bath. Then you use wires and pins to shape and open it up. It's like a bud blossoming to reveal its inner beauty. The yarn is Bertha from Dirty Water DyeWorks. 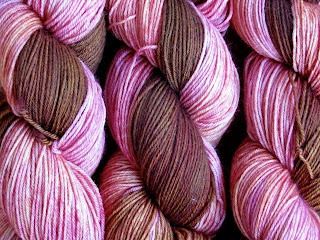 Bertha is a blend of 80% Merino, 10% Cashmere, 10% Nylon. 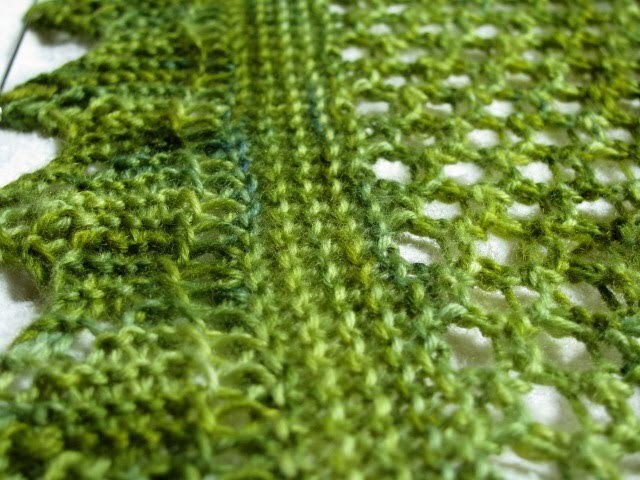 The colorway is Pixie, shades of green with occasional flecks of blue. The blocking wires I use are HandWorks Dressing Wires. I can't recommend this company enough. Lisa, the owner, provides prompt delivery with great customer service. And part of the profits are given to the Susan G. Komen Breast Cancer Foundation. I usually putter around for a day or so after finishing a project, searching out my next pattern. Not so this time around. Before Aestlight was even dry I had already cast on for my next shawlette. Next up - les Abeilles. The cooler weather has me thinking of scarves, mittens and hats. No matter how many I churn out it seems that these items are always in short supply. My plan was to knit a bunch over the summer, but somehow that never happened. 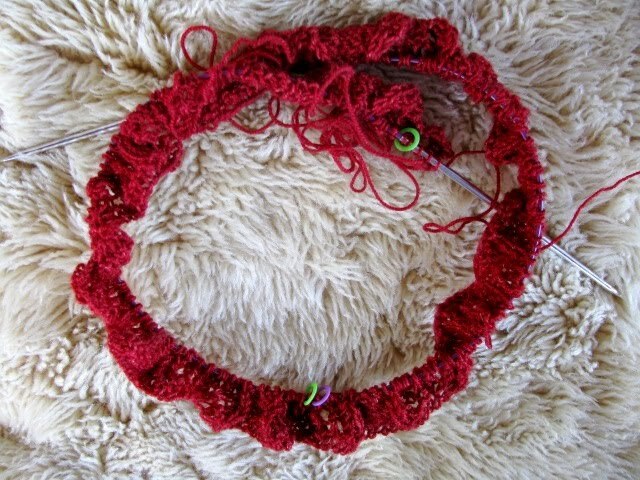 I do have one scarf under construction, almost finished. This is the One Row Handspun Scarf. 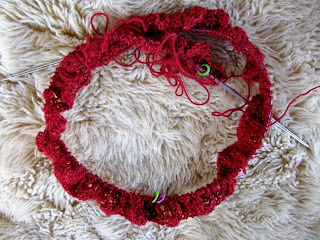 The yarn is a mystery yarn, the ballband long gone. This will be a donation for The Red Scarf Project. If you have time for charity knitting, you might want to consider this cause. The Orphan Foundation of America, the sponsoring organization, sends Valentine's Day care packages to foster kids who are in college. A scarf is included in each package. OFA is accepting scarves now. See the link for more details. 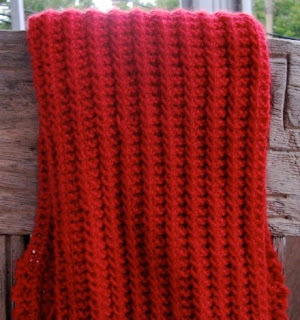 Another scarf project I'm planning is a scarf knit by everyone in the household. I've done this before, and it's a good group project. 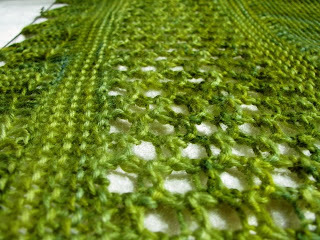 I'll cast on for a scarf, start knitting and leave it out for others to pick up and knit a few (or many) rows. In an effort to get everyone to participate plain garter is best. And it helps if the yarn is colorful and fun. Yes, there are variations in gauge making for a thick and thin scarf, but that's half the charm. I really need some mitts but have put this project on the back burner. I have my old standby pattern, tried and true. I should cast on and get started, but I got distracted looking at other patterns. I stopped by SpillyJane (Ravelry link) to browse. I made her Owlmittens not too long ago, and I love her designs. As luck would have it, she's having a sale on patterns. Buy 3, get 1 free. Buy 4, get 2 free. Buy 5, get 3 free. I'm sold. That was the easy part. The hard part is deciding which patterns to get. 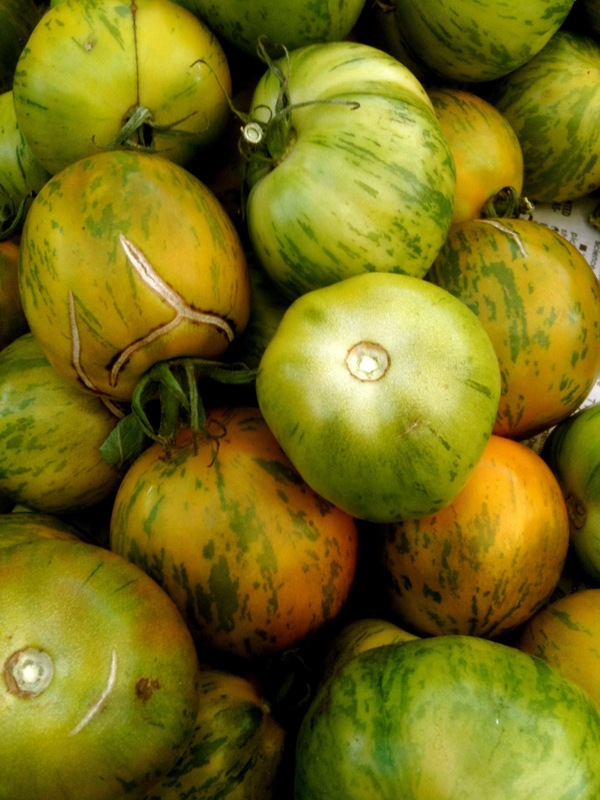 My color inspiration for the week comes from the farmers' market.
. . . with stripes. 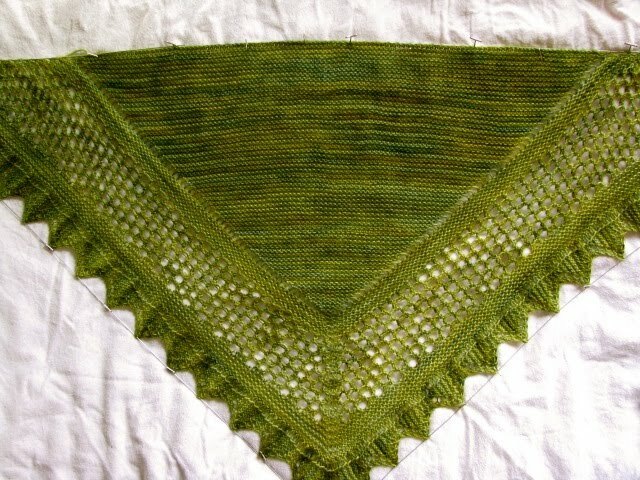 I'm at the beginning of the end, the end of Aestlight Shawl (Ravelry link). The last couple of days I found myself with more knitting time than I had anticipated. I can handle that. I finished the lace section in spite of some backtracking. There are times when counting to 4 can be challenging. I admit that right now this section doesn't look like much. 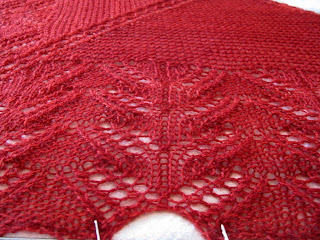 After a bath and a good blocking I'm sure it will look stunning. I've moved on to the border. This is either the home stretch or the halfway point - depends on how you look at it. 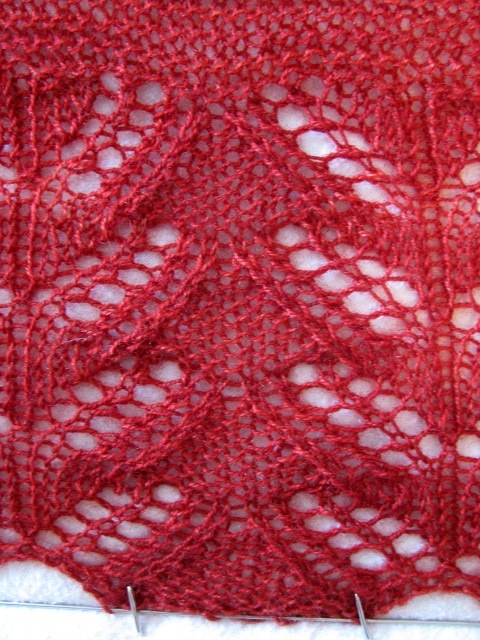 This design uses a knit-on border. The stitches on the right are the border stitches that are joined to the body stitches on the left. 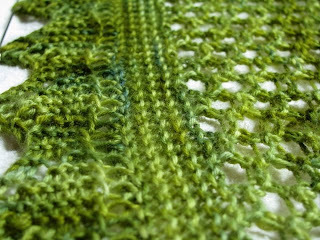 Every other row a border stitch is knit together with a body stitch. I have no delusions that this will be a quick and easy section. I've been here before. 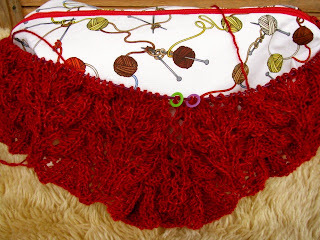 Sometimes knitting and attaching the border can seem to take longer than knitting the body. I have almost 250 body stitches. 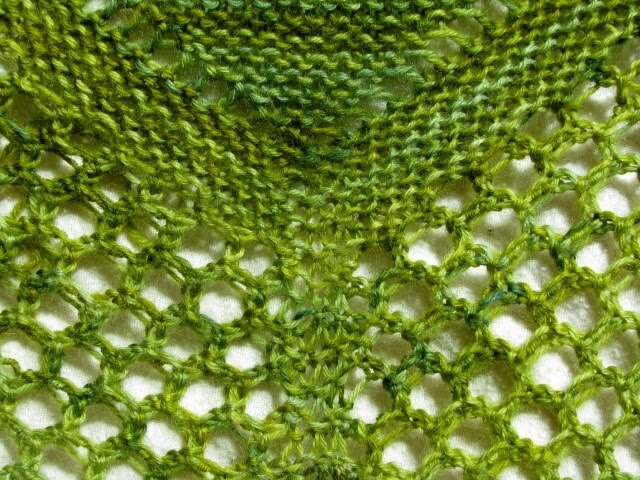 Remember there are 2 border rows for every body stitch. 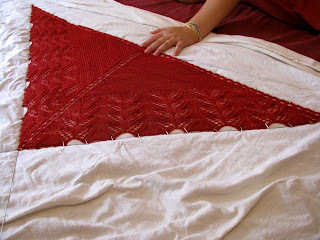 With a few extra rows to accommodate the point of the triangle that makes for over 500 border rows. Granted they are short rows. But I know that the back and forth, back and forth can be monotonous and tedious. This is where I plug into a good movie or audio book. It helps to have company crossing the border. With the change in seasons comes a change in our menu, a change to warmer foods. 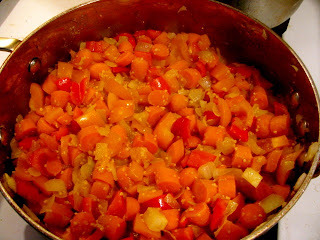 I cooked up this mixture of peppers, onions, carrots, garlic and spices for a batch of black bean soup. The peppers are so colorful this time of year. It's Monday morning, and I have a case of "where did the weekend go?". 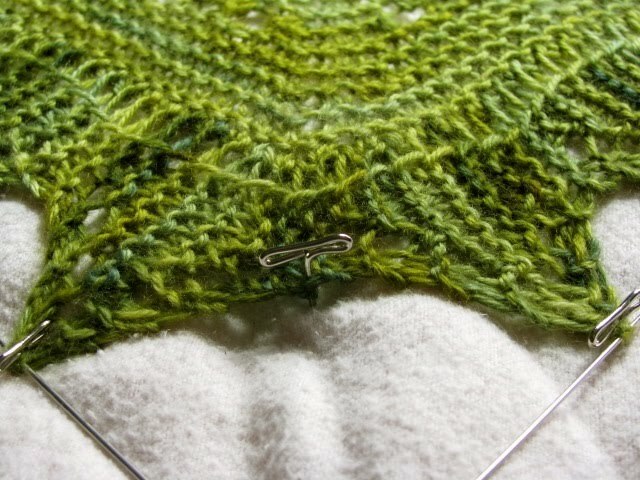 So many projects unfinished, so many loose ends dangling. That can mean only one thing . . .
~ I attended the Common Cod Fiber Guild meeting on Friday and heard Daina Taimini speak about Hyperbolic Crochet. What is that? Daina is a mathematician who wanted to create a visual representation of spherical planes. She started fooling around with crochet and some numbers and was able to do just that. In the process she created some unique, colorful pieces. The icing on the cake is that she was approached by art museums and galleries and has been displaying her math-inspired, crocheted pieces of work all over the world. A fascinating story. You can find out more in her book, Crocheting Adventures with Hyperbolic Planes. ~ Since I'm on the topic of crochet, I have to mention Kingyo. This is the crocheted version of the Japanese goldfish. While I haven't had time to try them out, there are detailed instructions with pictures. Have fun! ~ Finally, I have to point you in the direction of maya*made, a site for clever ideas and inspiration. I could spend hours and hours browsing this site. Wool blankets instead of insulated lunch bags . . . who knew? The other day we made a quick trip to the beach, probably our last for the season. It was a bit chilly, and only one of the kids went into the water. A dragonfly stopped by to visit. 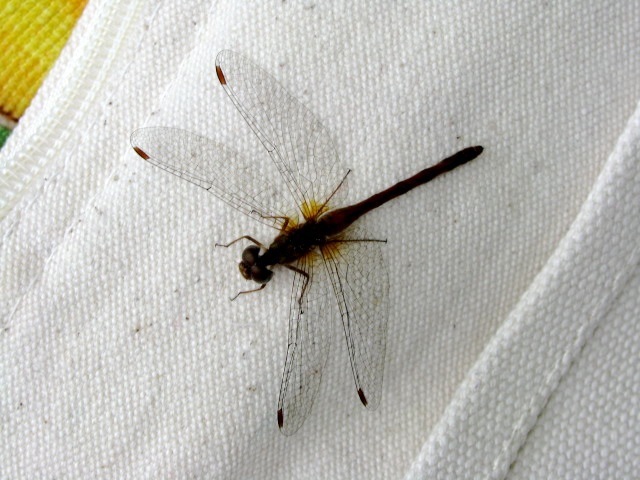 Wings thinner than paper, delicate and fragile. I'm still on my shawlette jag. I've ignored the fact that I have a sweater or three to finish, I'm in dire need of fingerless mitts and I had a recent request for a poncho. I had no sooner cast off Multnomah when I began searching about for my next shawlette pattern. I have a few patterns queued up in Ravelry and a list that I haven't even added to my queue. 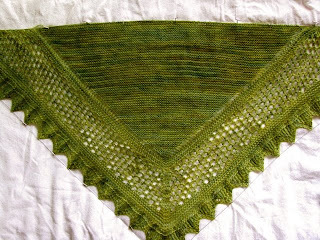 I settled on Aestlight Shawl (Ravelry link) by Gudrun Johnston. I'd been contemplating this pattern for quite a while. No time like the present. 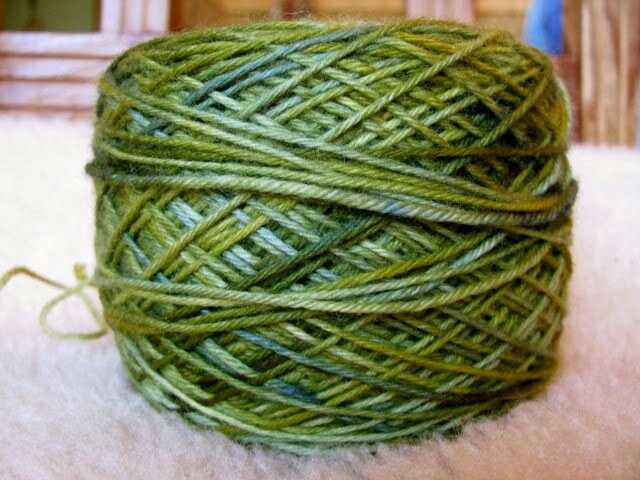 I debated about which yarn to use and finally chose this one. This as-yet-unnamed colorway recently came out of the dye pot. I love the subtle shifts of green and the bits of blue that peek through every now and then. I cast on and got right to work. This pattern starts with a center triangle and moves out to the border. In no time at all I had this to show for my efforts. Knit, knit, knit - gotta love garter. The triangle is complete and the stitches have been picked up along the sides. I'm ready to start working out from the center. Things will probably get more complicated, and this might not be such a good traveling companion any more. But I'll give it a try as I'm anxious to watch the design unfold. 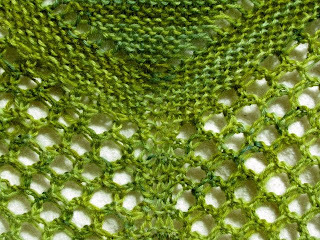 For those in the Boston area tonight is the Common Cod Fiber Guild meeting. The topic is Hyperbolic Crochet presented by Daina Taimina. I'm intrigued and looking forward to the meeting. My color inspiration for this week is the long-awaited tomatillos from the farmers' market. It would appear that I'm stuck on green. Green with a tinge of purple. 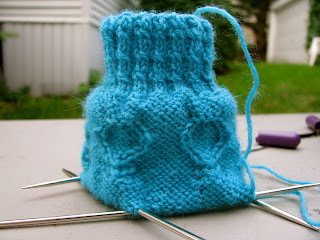 I have a new sock project - a project that has made me set aside all other socks in progress. I ordered this sock kit when I first heard about it. I anticipated its arrival. When it was finally delivered, I couldn't wait to get started. This is The "Egg-stra" Special Sock Kit by skacel. Skacel had this sock designed to raise awareness of ovarian cancer and to raise money for ovarian cancer research. The kit was designed to honor Susanne Skacel, a three year survivor of ovarian cancer. Since this is a cause near and dear to my heart, I was more than happy to order the kit. 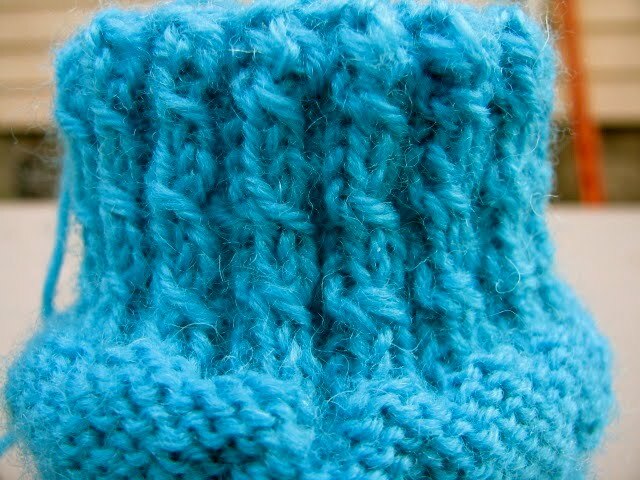 The leg of the sock is made up of three sections with different stitch patterns. Each section is designed with special meaning. I've just completed the first section - the circle with the cross. This is the universal symbol for women and also represents the earth and the Roman goddess Venus. 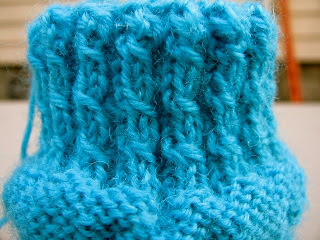 The yarn is Trekking dyed in a special teal colorway, Susanne. Teal represents ovarian cancer. Timing is everything . . . September is Ovarian Cancer Awareness Month. 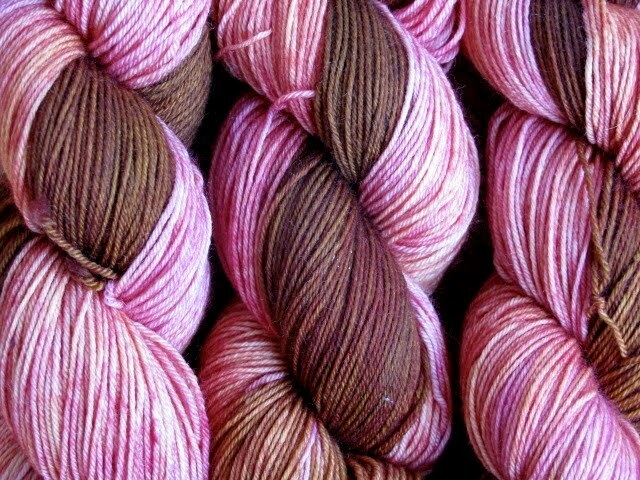 This kit is available from WEBS and The Loopy Ewe. All proceeds go to the Marsha Rivkin Center for Ovarian Cancer Research. To learn more about ovarian cancer, check out the Ovarian Cancer National Alliance. While I'm on the subject of socks . . . I often hear knitters moan and groan when it comes time to graft the toe with kitchener stitch. They can't remember how to do it. Or they get started, become confused and can't seem to get back on track. For those who have issues with kitchener stitch, I suggest you look at this tutorial from Laura Nelkin. Laura has clear, precise, step-by-step instructions along with pictures. She's even included a mantra to help you be one with kitchener stitch. Be sure to check out Laura's designs for ideas and inspiration. Recently I helped a friend move. 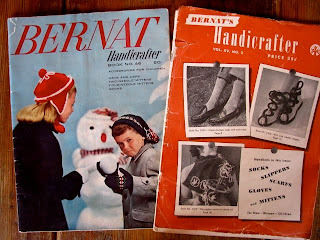 She was sifting and sorting through piles of things when she came across a stack of old knitting patterns. Was I interested in taking them? You bet. 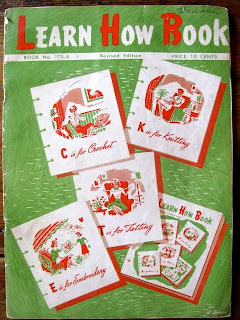 I have quite a collection of vintage knitting books and patterns. A few years ago I inherited some from my aunt when she got rid of her knitting things. Others I have picked up here and there over the years. I'm always on the look out to add to my collection. 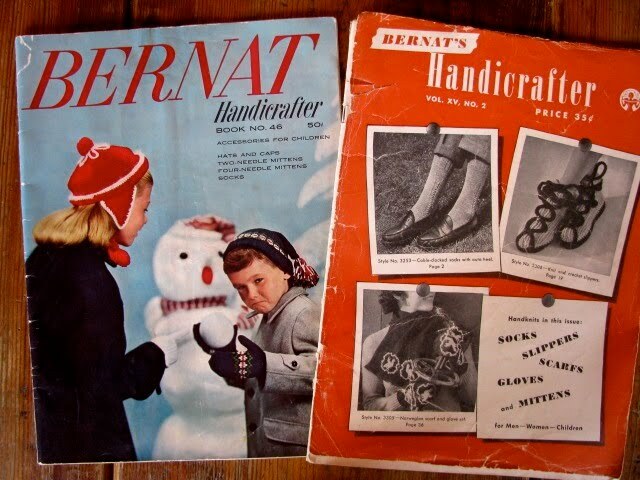 New to my library . . .
. . . these two issues of Handicrafter from the 40s and 50s. 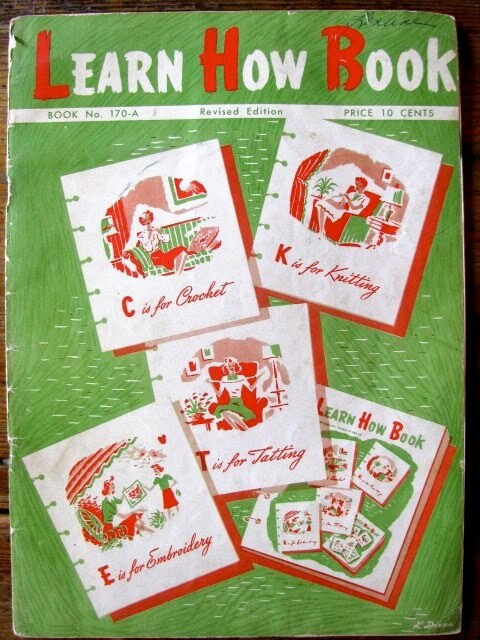 I love to read old patterns. They can be a source of inspiration. 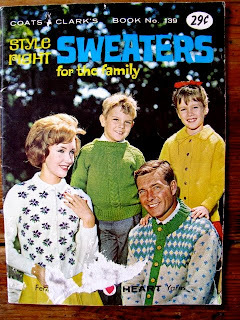 It's also interesting to note how knitting techniques and pattern writing have changed over the years. 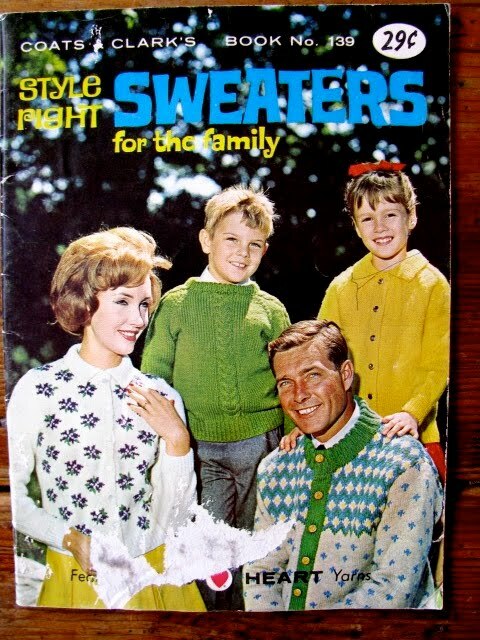 Then there is this booklet with a classic family photo from the 60s. Another version of the Cleavers. 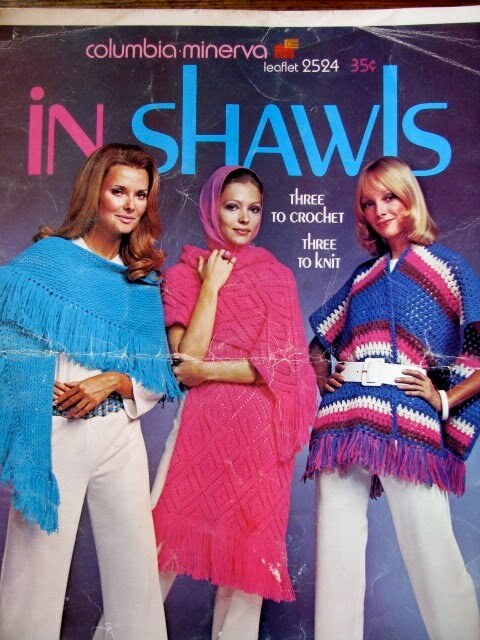 And from the more modern 70s . . .
. . . shawls to knit and crochet. Sometimes you just have to laugh. I was excited to see this booklet in the pile. I had a copy of this when I was a kid. Seeing it brought back fond memories although I don't think I'm going to take up tatting any time soon. In keeping with the vintage theme I recently stumbled across Efreeme. Check it out if you're interested in vintage and handmade items. Earl is approaching, and it's time to batten down the hatches. I leave you with my color inspiration for the week. 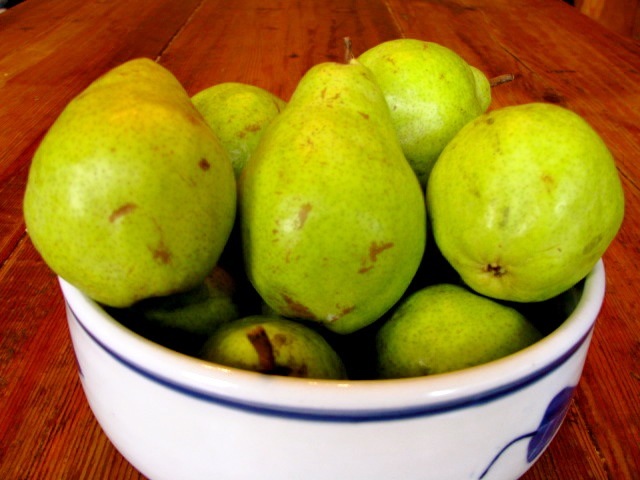 New pears . . . a refreshing yellow-green. There's been a lot of color play going on around here. Almost every night there are 2 or 3 people sitting down with paper, pastels and pencils. Doodling and drawing. It's fun to watch the process. What starts out as one thing often evolves into something completely different. The process is fluid and dynamic. The colors I've been playing with are in the dye pots. That process, too, is fluid and dynamic. Sometimes the results are predictable. 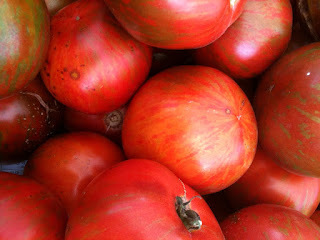 We've been feasting on fresh tomatoes for quite a while now. 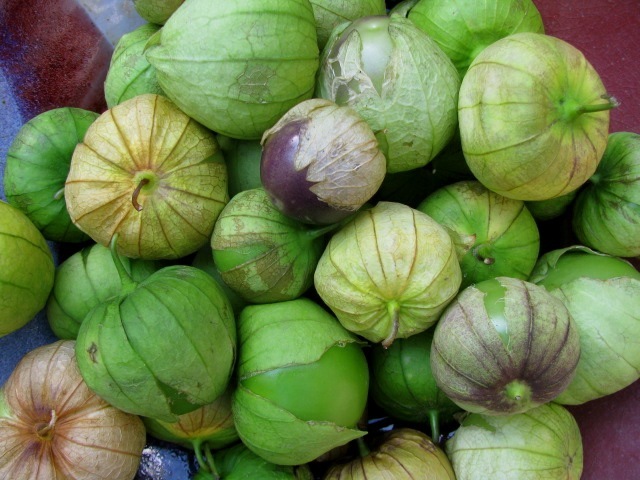 Every week I bring home a load from the farmers' market. 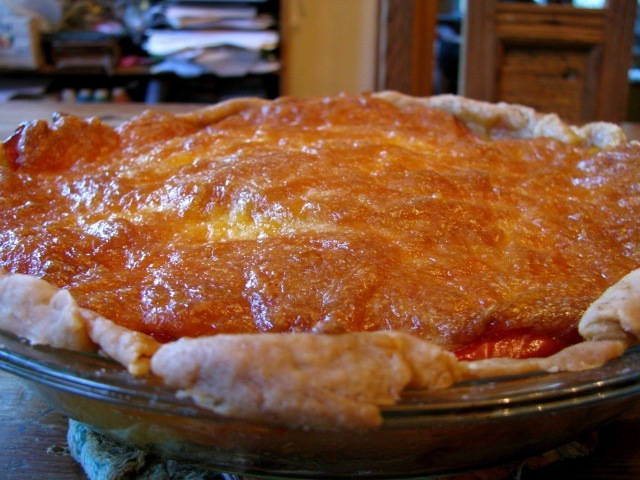 There's no better way to celebrate the tomato than tomato pie. You can find the recipe here. 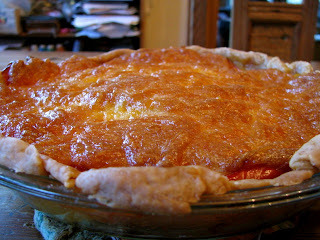 The only modification is I make my basic quiche crust instead of using the Bisquick. If you like tomatoes, you won't be disappointed.